Dr. Hekmatyar and his staff are wonderful!!!! He was recommended to me by a friend over 15 years ago and I'm SO happy I listened to her. Growing up I had a lot of dental work done and i began dreading visits to the dentist. Ft Thomas family dentistry makes me feel welcome and comfortable no matter if I'm there for a cleaning, filling, or a crown. I highly encourage you coming to ft. Thomas dentistry. I incidentally stumbled upon Dr. Hekmatyar, and his team, several years ago when I was looking for a dentist who would accept my children's insurance. I was a full-time college student, working part-time, and my children were on Medicaid. From the beginning, I always felt valued, regardless of our financial situation. We were consistently treated with respect. I am not sure they will ever be able to understand how much that meant to me in that time of my life. I finished graduate school, landed a great job, AND a great husband. My family doubled in size, and now all eight of us are patients of Dr. Hekmatyar! He and his team have seen us through the challenges of kids in braces, fillings, crowns, extractions, root canals, and even an implant! At this point, I cannot imagine ever going to another dentist. Their level of expertise and customized care have come to mean so much to me and my family. I can genuinely say that in the eyes of Fort Thomas Family Dentistry, I am not just another patient, and neither are you! I can't say enough positive things about Dr. Hekmatyar. I just recently started going to his practice and have been so impressed. He has such a nice demeanor and really puts you at ease. He even called me at home at night to check on how I was doing after a procedure, which is totally going above and beyond. His staff are really great as well. Dr. Hekmatyar and Raymie make an exceptional team for someone like me. I used to hate to go to the dentist, but their technical expertise and their humor and kindness put me at ease. I am now looking forward to scheduling a cleaning. 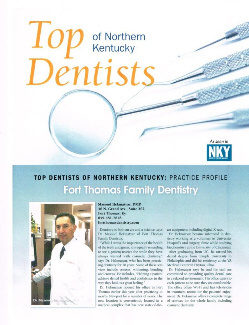 I have been going to Dr.Hekmatyar for years, so if you need a good dentist come to FORT THOMAS FAMILY DENTISTRY! I have been coming to Dr. Hekmatyar for years and it is always a great experience. I recently had a dental emergency and Dr. Hekmatyar went above and beyond to make me comfortable. I couldn't be happier with the final results! Raymie does a wonderful job with her cleanings and the rest of the girls are so friendly and caring. Everyone makes sure you are getting the best care around. I would highly recommend Fort Thomas Family Dentistry for all of your dental needs! I have been coming here for many years and I brought my children here as well..There is no better dentist or staff than these people. They have always been there for me not just with my teeth but family issues as well. Always ready to listen to any problems I have, and for the Dentist Masoud the work he has done in my teeth has been nothing but amazing. Because of his great work I don't use novacain and have a fat lips for hours he is gentle and has never hurt me. I adore these people and if your looking for caring medical people like we use to have. Look no more. make your appointment and trust me you will never leave them. Anyone that knows me knows I am very dental-phobic. Needless to say, it took my husband most of our 25 years together to convince me to go see his dentist, which happened to be Dr. Hekmatyar. I finally was forced to go due to bad toothache which turned out to be impacted and infected wisdom teeth. Dr. Hekmatyar was so kind.. he knew of my phobia. He recommended a wonderful oral surgeon for me to see. Since then I have had a few fillings, a root canal and 3 crowns. I now go twice a year for cleaning and my phobia is gone. I have never met such a kind and caring dentist. He called me at home the evening I had my first filling, he just wanted to make sure I was doing ok, and not in any pain. How many doctors will do that?? I cannot say enough good things about him. I do recommend him to friends and have had a few friends that have switched and are so happy that they even recommend him to other people. The office staff is wonderful as well. Everyone there is terrific. If there were more stars to give, I would do so! I can honestly say, I love my dentist! My wife and I were uncertain the first time we went to Dr. Hekmatyar’s office. It’s in a strip mall, not a professional building. And the guy who cuts our hair recommended it, so . . . well, what did he know about dentists? But the haircutter had great teeth, and we were new to town, so we gave Dr. Hekmatyar a shot. That was 5 years ago. I can’t tell you what a wonderful office this is. They are as welcoming as they are professional, which is a combination I’ve rarely come across. And most important, the work they do is great. (I understand why the haircutter had such great teeth.) When I was a kid, the first dentist I had was ghastly. It put me off dentists for a long time. Today, I have an 18-month-old son and I can’t wait for his first dentist visit. I know that first visit will set him in the right direction for a lifetime of good dental health. I really can’t recommend Dr. Hekmatyar enough. I really love the people in Dr. Hekmatyar’s office. I have a lot of problems with my teeth and have been pleasantly surprised by the fantastic service I get from the entire staff! Dr. Heckmatyar spends a lot of time talking to me about my options, the costs associated with each option and even calls me at work to answer any additional questions I may have. He goes way above and beyond the call of duty! Raymie is always very gentile and so sweet to chat with while she cleans my teeth. Lisa and Tina are always very helpful, informative and friendly and Michelle & Krista greet me with a friendly smile when I walk in the door. I know, every time I have an appointment with the Dr. Hekmatyar’s office I will be well taken care of and I can trust the advice and guidance I receive from the entire staff. I highly recommend Dr. Hekmatyar’s office to all my friends and family and to anyone looking for a dependable, friendly and thorough dentist! Just wanted to say I love this office.Dr.Hekmatyar and his staff is always so caring,friendly and helpful.I have been going to Dr.H since I was little and never have had a bad experience.Dr.H and Raymie are always so gentle and informative.I would highly recommend this office for your dental needs. I’ll be honest, I’ve had my fair share of cavities. Dr. Hekmatyar always takes the time to explain the procedure and makes sure that I’m doing well throughout. The folks at the front desk and dental hygienists are always professional and courteous. My family has been with Dr. Hekmatyar for many years and we’ll continue to recommend his office to friends and family. My family has been visiting Dr. Hekmatya’s office for over 8 years now and have nothing but nice things to say. We are always greeted with smiles and Dr. Hekmatyar is very professional. 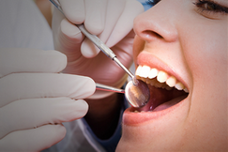 He and his dental hygienists are straight forward with you about what you need to do to improve the health of your teeth and gums. I appreciate their honesty and professional opinion. My son, who is 5, even walks back by himself because they are so gentle. I would recommend Dr. Hekmatyar to anyone in need of dental work. Visiting the dentist is never fun, but I must say that Dr. Hekmatyar and his staff made my visit as pleasant as I could hope for, considering that I required a deep cleaning. Everyone was very friendly and most importantly, they provided a thorough cleaning with a surprisingly gentle touch. I’ve been to many other dental offices that seemed to want to just rush through the procedures and in the process made the experience painful. Dr. Hekmatyar and his hygienist took their time and made the procedure as comfortable as possible. I love the office staff at Dr Hekmatyar’s office – from the front desk, to the hygienist, to the doc, they are very pleasant, comforting and caring. They’re also incredibly flexible with my appointment times. I would strongly recommend them.